Revell launched into the HO-scale model train market in the mid-1950s. Among its motive power offerings was EMD’s SW7 diesel switcher. The Electro-Motive SW7 diesel locomotive saw production from 1949 to 1951 with nearly 500 examples going to work for railroads across the U.S. 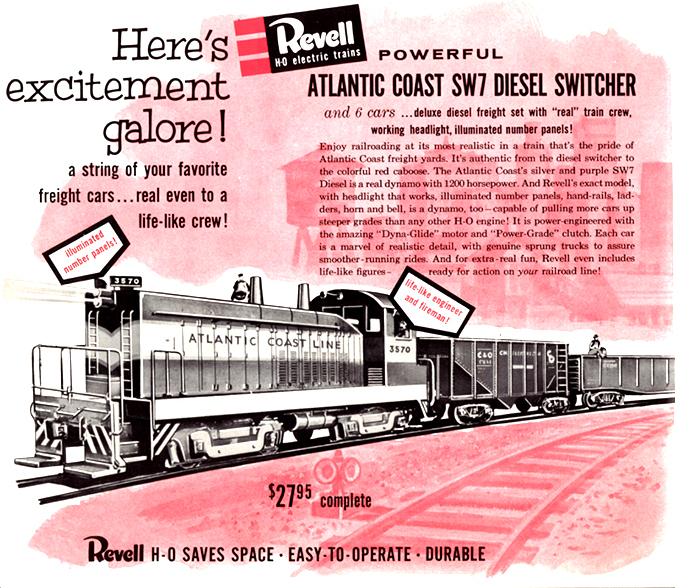 The first plastic model to reproduce this versatile 1,200-hp diesel switcher came from Revell in 1956. Revell offered its SW7 in two versions. 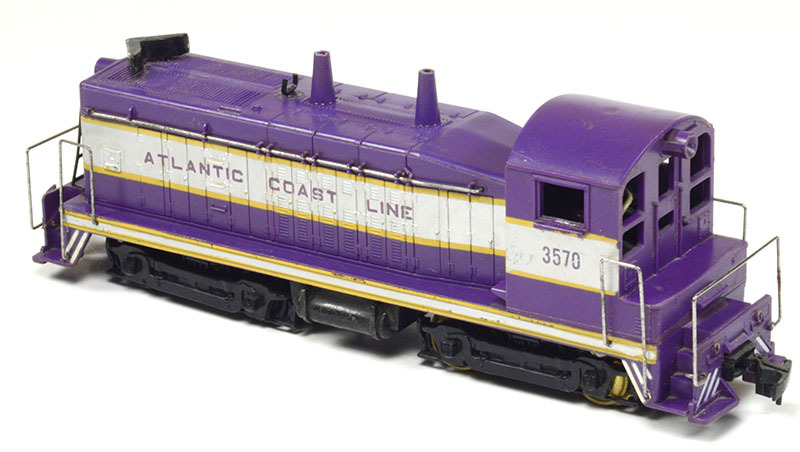 This purple Atlantic Coast Line (ACL) SW7 is Revell’s deluxe release. This enhanced model came with illuminated number boards on the front hood over the radiator grilles, ladders on the nose, and additional handrails not provided on the standard SW7 offerings. The ACL SW7 received prominent coverage throughout the many Revell promotional catalogs. 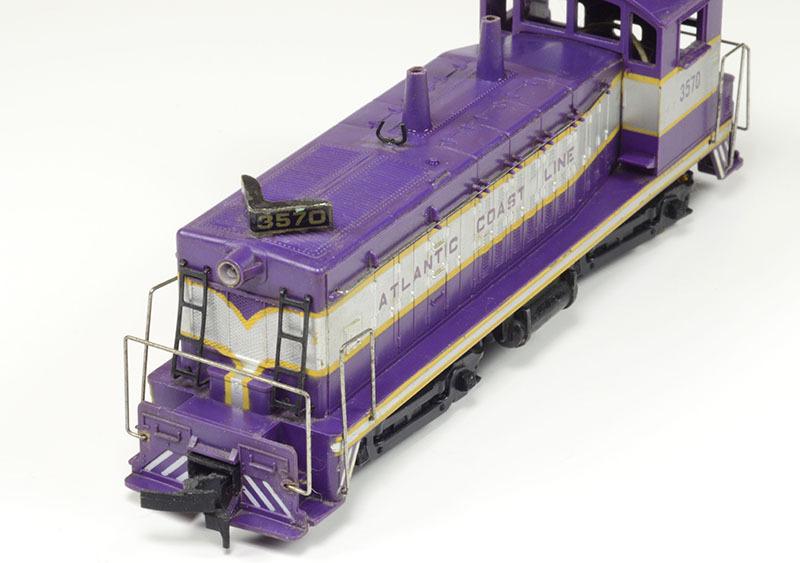 This two-color image appeared in a l950s Revell catalog promoting HO as, “twice the fun in half the space.” This $27.95 train set included Revell’s deluxe SW7 on the point of its six car consist. In addition to its ACL switcher, Revell also cataloged a Union Pacific SW7 for the 1956 debut of its line. 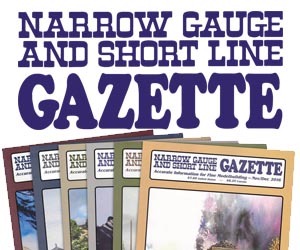 Later releases saw Revell add New Haven, Santa Fe, and Southern Pacific SW7 roadnames. Watch for additional Revell coverage coming in the pages of HO Collector!